Checa took pole with the fastest lap. 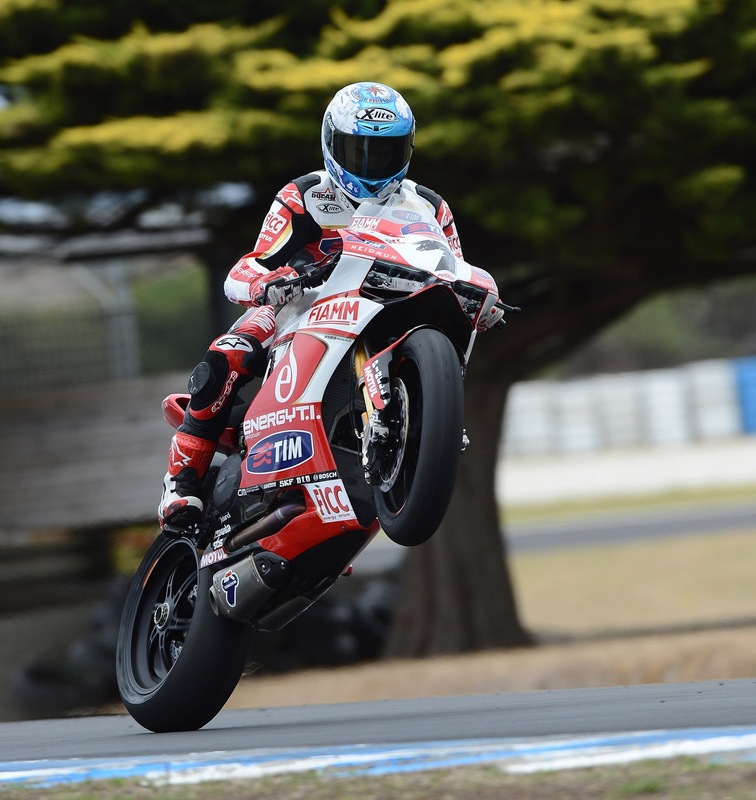 Carlos Checa has taken the first Superpole of the year in Phillip Island for the Ducati Panigale in its first WSBK round. Times are quite a bit faster this year due to increased grip after the circuit was resurfaced over winter. A change to the grid formation now means the riders will line up in rows of three rather than four, this means that in SP3 9 riders fight for the first three rows. In SP1 Sykes got off to a good start setting a 1’30.841, comparing with the race lap record of 1’31.785. Sykes was followed by Melandri, Laverty, Checa who is running battered and bruised after a huge Friday highside and Leon Camier. For a while it looked like Loris Baz wouldn’t make the cut for SP2, however he put a lap in towards the latter end of the session to drop Max Neukirchner out with Stauffer (who fell midway through the session and failed to get back out) and Clementi. All weekend, the top 13 have been within a second so SP2 was always going to be a toughly fought battle for the final 9 places in SP3. As such, most riders opted to go out on the softer qualifying tyres. Laverty topped the session with a 1’30.678 set quite early on, followed by Sykes on a 1’30.696. Melandri, Checa and Guintoli made up the top 5. With 2 minutes to go, PATA Honda’s Leon Haslam was in P9 whilst his team mate Rea along with Baz and Davies were in the drop zone. Rea knocked Haslam out with 30 seconds to go leaving Haslam one lap to get into SP3, he crossed the line to take the chequered and go 8th, knocking out Giugliano. Loris Baz and Chaz Davies also failed to make it into SP3. All manufacturers were represented in the top 9 SP3 session battle for pole and we were seeing 1’30 laps from the off. Melandri set the pace early on with a 1’30.615 and this was immediately followed by another 1’30.615 from Sykes, the Brit marginally faster and taking the top spot. After riders had pitted for tyres the final battle for pole began, times were looking a little slower than the 1’30.3s set in qualifying practice by Fabrizio until Checa blinded the field with the fastest lap of the weekend, a scorching 1’30.234. Fabrizio couldn’t quite manage as fast as he went in the practice sessions however 1’30.581 was quick enough for second place, until Laverty robbed it on the chequered flag with a 1’30.429. Sykes leads the second row from Melandri and Guintoli. Camier heads up the third row from the PATA Hondas of Haslam and Rea. *Badovini will not race this weekend due to a broken foot. Next Next post: Sykes: Qualifying is qualifying, racing is another story.